The underseal on this fender looked to have been a little thinner and virtually all came off with a little help from a power drill and few wire brush attachments! The metal underneath was in great condition, virtually solid and no holes in it. The only place seems to have been on the bottom of the headlight recess where there was no rubber grommet in place. i suspect the water collected there and it started to rust a bit. It’s not bad to be honest. Untreated 1 – 4 were how the fender was when it came of the car. Rubbed down 1 – 5 were after the wire brush treatment. Although the work is not finished yet I will add more pictures of the first coat and second coats next weekend. But it’s amazing the difference between the two sides! Time has come to remove the outside paintwork ready for some proper paint. I started this in my garden and then completed it down at the Mustang Maniac panel shop. Again plenty of stripper applied, scrapper, wire wool and lots of energy to remove the most of the layers. I aided a little help from my Dewalt DA sander which helped a fair bit. The back bottom of the fender had a few pin holes in it and was cut away and Terry fabricated a new part and welded it in place. 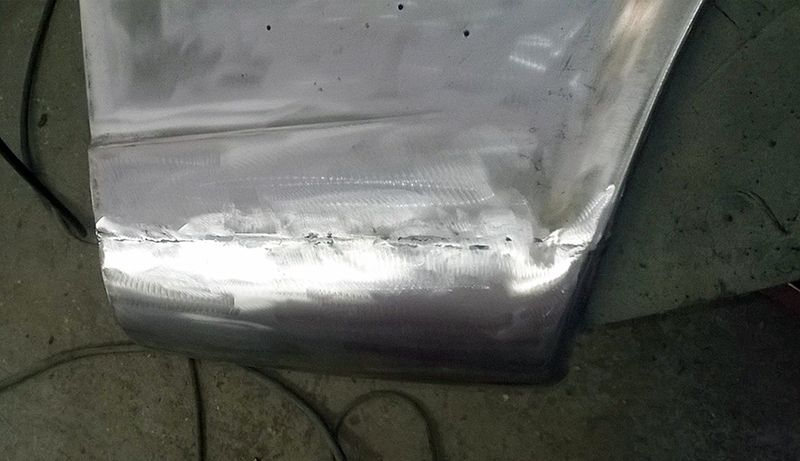 The rest of the fender was fine and needed only a light patches of filler to remove the minor imperfections. Yogi applying his magic got it almost perfect within an hour or so!